Here’s an interesting fact: All dogs need to be groomed. It’s as quick and simple as that! But then again, we feel it’s probably best to expand a little on this as the idea of “grooming” has different meanings to many of us and whether we have cats, dogs or both it is definitely a good idea to understand the basics. In a previous blog, we mentioned the benefits and necessity of aiding your cat to stay groomed, but perhaps not everyone is aware of the benefits and requirements of grooming our doggy pals. So, what do we (as super loving doggy parents) need to consider when we think about grooming our canine chums? Well, first up, this is definitely not a “one size fits all” activity. Different breeds and different dogs have their own preferences and demands. These demands will also vary from season to season and during the life stages of your dog. What is consistent though is that regular grooming is definitely beneficial and whether that activity is a weekly brush or a scheduled appointment with a professional (like GVC’s resident grooming guru, Uncle Samer), grooming is good! It puts your dog at the center of your attention and this will make every dog feel fantastic! It gives you a chance to really get to know your dog’s body and help detect any little cuts, bumps and changes (including ticks) that you may want to discuss with your vet. Of course, we do advise a regular visit to a professional groomer and by regular we mean at a frequency that suits your dog’s needs. This may be once a year or it may be every two to three months, this will depend on breed, age, health and many other factors, such as season and climate. 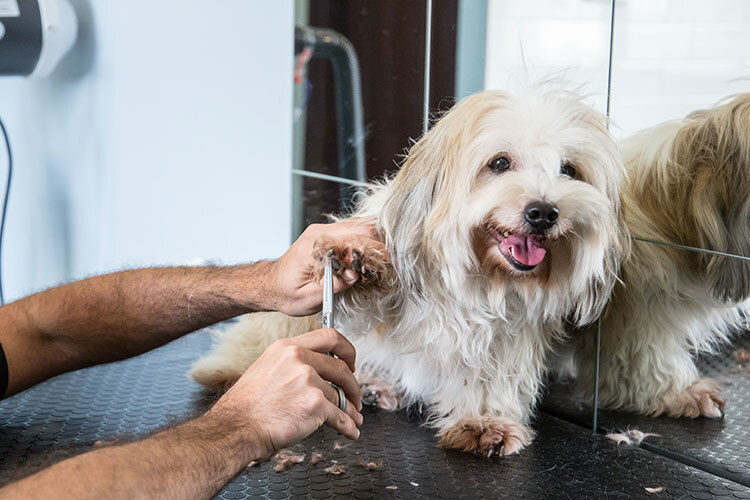 In the UAE, having a regular trim can certainly have a positive health impact for many breeds, especially during the hot and humid summer months, although let’s be honest, it’s pretty warm all year and not every breed is exactly suited to the desert climate (nor that dust and dirt mentioned above). This is why we at GVC have included grooming services within our Pet Health Club benefits package. So not only will a professional groomer be able to provide the super sleek styling (both a health and aesthetic benefit – and the bonus reduction of free floating fur around the home) but also a regular visual (and hands on) health check of your dog’s fur and skin as well as the very important trimming and maintenance of your dog’s claws and pads. Unmaintained and overlong claws are in the top five disorders and causes of discomfort that affect dogs in the UK (information provided by The Kennel Club). However, trimming and maintaining a dog’s claws can be a tricky business as all dog breeds have a section of blood vessels and nerves running through much of the claw/nail, called the Quick. A poorly executed pedicure can be a very painful experience for your pooch. This is why we would recommend that, unless training has been received, owners would be wise to let a professional look after their dog’s paws. However, please do be aware that not all dog grooming “service providers” employ professionals and a poorly trained groomer can potentially cause both physical and mental stress for your pet. At GVC, our clinical team have had plenty of experience in fixing up unfortunate victims of the not-so-professional groomers out there and therefore we really do know that the cost of getting it wrong will be far greater (both physical and financial) than the price for making the right choice. Luckily, we at GVC are very fortunate to have an ongoing collaboration with Pooch Parlour and Uncle Samer who has an Extended Diploma in Breed Specific Dog Grooming and Dog Handling from the UK. Samer’s animal grooming approach is ethical and caring and includes cage-free, muzzle-free and restraint-free methods. This makes a visit to Uncle Samer the doggy equivalent to a spa day… stress free pooch pampering with the tail wags to prove it. To make a booking or learn more, please email info@germanvet.ae or call 02 556 2024 today.